First, consider the fact that website analytics and content analytics may not be the same thing. For example, websites like Amazon are measuring the shopping cart experience and sites like Google are measuring the speed to deliver search engine results. Both of these are valuable metrics for the performance of their sites and may not have as much to do with content as it has to do with the back-end performance and engineering of the website. Second, full disclosure here, I am not an marketing analytics strategist. I am a content strategist, which means I need to be effectively communicating the goals of my content with an analytics strategist. Hence, I need to have clarity on the performance metrics of my content, so that the analytics team can communicate the way my content is performing. I’m not trying to do the job of an analytics strategist, and if you’re anything like me, you probably should not either. That said, you should know enough about website and other digital analytics to communicate your intention to analytics strategists, as well as other strategic disciplines. Otherwise, you will be getting back website analytics reports that really don’t help you to understand if your content is having the desired impact on your target user. 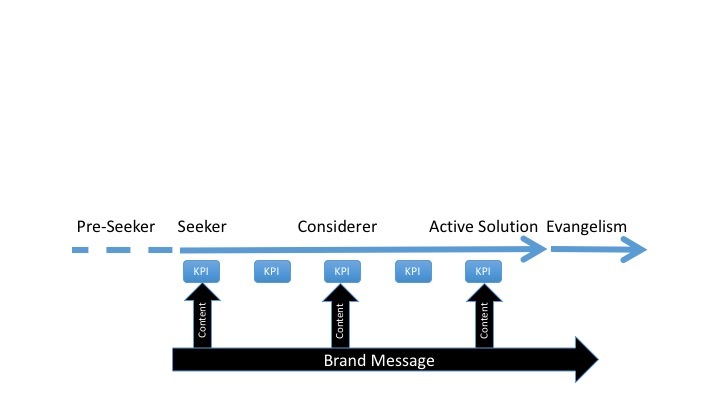 I believe that all content and key performance indicators (KPIs) must align to the user journey. To me, this is the most basic reason to create content. Specifically, you are helping to move users along their personal user journey to make a decision. Many brands will take a different position on this and create content for the sake of entertainment or general enlightenment. This is a strategy that is probably part of a larger, more deliberate plan to develop or reinforce brand recognition or identity. There are any number of ways that you can (and cannot) measure this kind of content, but it’s almost certainly going to be different from that I’m going to share here. The idea here is to create marketing content that complements the way users think about brands and solutions. Specifically, if you consider the role of the brand, the solution solves an essential user need, usually triggered by conflict (“I need something”) or desire (“I want something”)…or a combination of both, of course. If your brand addresses the “wants/needs/desires” of your user, the user needs information to answer intellectual questions that help them move along their journey. And let’s be clear, this is not always going to happen on your owned brand.com properties, especially if there are communities and review websites that serve the larger community. Users will go to trusted sources and community to satisfy certain queries and build a base of knowledge about all of the brands in this space (i.e., your competitors). 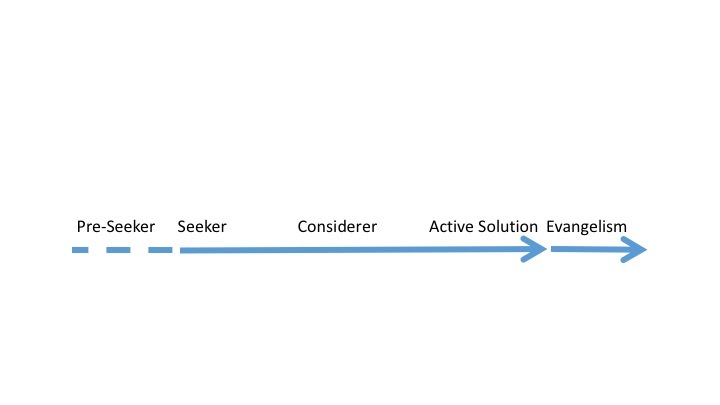 Full user journey with pre-seeker and evangelist. 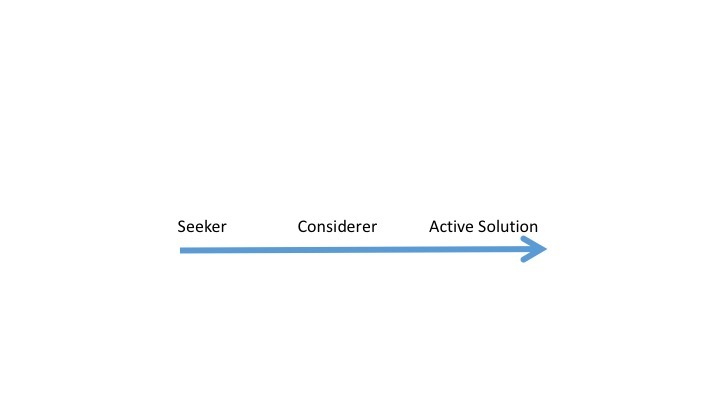 For the purposes of focusing the conversation, let’s just look at the most common areas for marketing, which are seeker, considerer, and active solution. There are certainly marketing tactics for pre-seekers and certainly tactics for evangelists, but I’d like to focus on this core set. Now, bear in mind, there are lots of ways for you to consider this journey and this is the vernacular that works for me. You may call your stages different things, but they probably mean the same thing. You can even align these basic stages to your sales journey and messaging matrix, but eventually it all comes down to these milestones. Brands can use content to share messages all along this user journey. (“Messages” being an extremely flexible concept!) Usually, it’s not one singular message, but actually content that’s appropriately tailored to the stage in the user journey. Users are pre-seekers first. They don’t know about a solution, but they are predisposed to be receptive to it. As they move through their personal journey as seekers, they start to narrow down some top solutions. Let’s just say that these solutions include both brands that are new to them and brands that they already knew about. At this point they become considerers. Think of the “c” in considerer for comparison. They are considering their options by making comparisons. Depending on the category, there can be many small solutions or big, giant expensive solutions. In certain cases, there’s a big decision process and lots of moving parts that have to fall into place for the user to move past the considerer stage. In this scenario, the user may need to mentally stitch together many different sources and create a mental or literal matrix to compare all of the solutions. I won’t go into it here, but I think that many brands fail to give the user enough content to help answer considerer questions. For any number of reasons, they just don’t offer the content, so the user is forced to seek answers elsewhere, most notably secondary sources. Of course, if the brand doesn’t answer the question directly, the user will be exposed to sources that may not answer brand questions adequately or accurately. Even though they may be well-intentioned, journalists, unpaid reviewers, communities, and any other user-generated content has the potential for mild and radical misinformation. Let’s say your user goes through the considerer stage and identifies your brand as the right solution (yay!). Your brand compares favorably and it’s time for the user to take action. This next stage is the active solution stage. 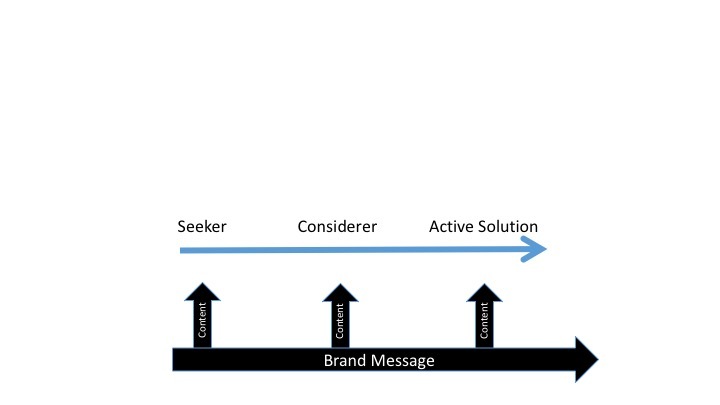 Most brands are usually pretty good in the active solution stage. This may be something as basic as where to buy, what options are available, and anything else that facilitates the user completing the basic journey of discovery and delivery. That said, brands do fall down here. They can still fail to serve the user. Even though they are converted, they are unable to become customers because the brand is ineffective at serving the basic needs of this almost customer. At this point, the user can easily back up in the journey, reconsider, and become active with another solution. But let’s be optimistic and just say that they user is becoming an actual customer because the brand answered all the required questions and satisfied the basic content needs in the active solution stage. That person may convert and become your customer. It can be as small as a pack of gum or as large as an enterprise software solution or even the city that hosts the next Olympics. Active solutions are relative to the need, right? Active solution is your customer. This particular user-journey map does not measure the customer relationships, which may be really short (pack of gum) or far, far longer. 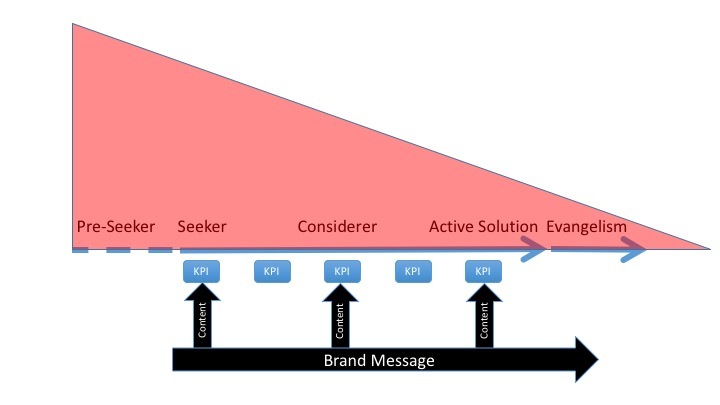 The service of your customer is going to be defined by different metrics that fit inside the active solution stage. The metrics for ongoing retention, repeat customers, and other measurables can be shallow or deep…and maybe not even measurable. There are complete disciplines of marketing and analytics devoted to this topic, so we’re not even going to do more than acknowledge that it exists. It is, of course, fascinating stuff and maybe we will explore it later. Last, but certainly not least, is the evangelist. This is the customer that is satisfied enough with your product to tell peers. They use the credibility of their relationship to advocate for a solution that helps solve their peers’ challenges. That is, a peer or friend has a similar point of conflict, so this evangelist recommends your brand or solution. This is not unique to the Internet, of course. It’s been around forever, even before brands. But social media has completely revolutionized the way in which evangelists communicate. Relationships still matter, but the nature of relationships and connections has changed dramatically. The evangelist is facilitated by your content. That is, if they are going to evangelize something, they need something with which to evangelize. It’s difficult to explain without examples, so let’s just look at this for a minute. If you love a brand, you might post it to your Facebook timeline and say, “this is great.” The people who follow you will see this and say, “hey, someone I know said that this is great.” That creates a virtual halo effect around that recommendation. In many cases, you can’t buy this or influence this with traditional techniques. You can, however, facilitate it with content that is optimized for the platform where your evangelist will share it. In this example, it’s the basics of a good anchor image and succinct text designed to be maximized for a Facebook timeline. Again, brands get this wrong all the time. You just have to look at shares on Facebook to see that there are lousy anchor images that aren’t optimized for Facebook with text that’s, you guessed it, not optimized for Facebook. There are a myriad of controls available to you as a brand marketer, but it would probably benefit you to work directly with your social strategy team to let them know what you want to accomplish, so they can optimize your shareable content (and the KPIs) to facilitate the sharing by evangelists. And that brings me back to the beginning. At one time, this was called a marketing funnel because the funnel started wide and then narrowed. In more ambitious scenarios, you might see this as an hourglass. That is, the funnel is wide, it narrows to the customer acquisition, and then flares out again during retention. Funnels and hourglass models are not completely irrelevant, mind you. I just believe that a user journey is a more effective framework because it’s about guiding a user through their own personal journey. The old frameworks and KPIs were based on old media models of cramming more people through the top of the funnel, which is what led to the broken model of advertising that is highlighted by banner blindness and other facets of advertising that users (including us) generally dislike. Marketing funnel aligned to the user journey to show declining audience and increasing value. A user journey suggests that we are serving the needs of our potential customers, guiding them to content that helps them make a decision, and support them as they become customers and even evangelists. One is about helpfulness and Youtility and the other is about ramming something down a funnel. This post is ostensibly about content marketing, KPIs and analytics, but it was important to express the basic idea of how users follow a journey that is guided by their own needs and facilitated by content. Some of that content, of course, can be on your brand.com and other owned and earned platforms. All along this journey, users are becoming progressively more valuable. The seeker is valuable, but may not become your customer. That means, by definition, the person still in the seeker stage is less valuable than your actual customer. Of course, some people will filter themselves out at the seeker and considerer stages, which is to be expected. Again, the most valuable user is your customer, but there are metrics to say that this person is also a customer evangelist, which indicates ongoing value. Let’s just align this to some sort of website framework, since this is your owned channel and something where you will have the most control. The About page for your brand is probably the most aligned with the needs of a seeker and is likely to get the most number of visits (or hits) from someone in that stage of the user journey. For all the eye rolling that it gets at content marketing conferences, users may need to know the features and benefits of your brand or solution. If you even say something that even resembles features and benefits, there’s often a huffy response about how users don’t want to hear about features and benefits. In certain cases, that may be true. But let’s face it, if someone is looking to make a purchase, they may love your clever content campaigns, but they are probably going to need details about features and benefits. Sorry, it’s just true. Some percentage of people who hear about your features and benefits will move along the user journey to the next stage and some simply will not. That’s where you can measure the impact of your content. Remember though, they can be entertained by your content, but still not be interested in your product, so just be clear about your content strategy and what aspect of marketing it addresses (e.g., general awareness, user journey to purchase, etc.). If you measure the seeker content (e.g., on the About page) directly against the content on the active solution content (e.g., Options like color or bundles, etc. ), the seeker content will appear to be more popular just by user visits. This is a massive red herring in KPIs that you need to discuss with your analytics team. The content on the active solution page is more valuable because it signals a level of intent beyond the initial research. If you don’t think a brand is what you need, you’re not going for a deep dive into the different options. You may get some basic info and then filter it out as you seek the brand that solves the conflict in your story. In the end, this all comes down to brand storytelling and how to provide content at every step of the journey. Analytics can help you determine how your content is performing. If you, as the content strategist, set these up properly and align them to content that satisfies all stages of the user journey, then you and your analytics strategist can measure some level of the content on your owned and (sometimes) your earned channels. This entry was posted in analytics, content, content strategy, Marketing and tagged analytics, analytics strategy, content marketing, content strategy, KPIs, Marketing, metrics, user journey by Buddy_Scalera. Bookmark the permalink.